China Glaze’s Island Escape Collection has been out for a while now. It’s a set of vibrant, sparkly colors but they weren’t really calling to me–except for the funny, yellowy green, Cha Cha Cha. I’m oddly only drawn to these types of sparkly, yellow-tinged greens-I don’t have a weakness for creme greens or anything that’s too dark, I just pass them by. This one just seemed so pretty and shimmery for the summer that I had to try it. 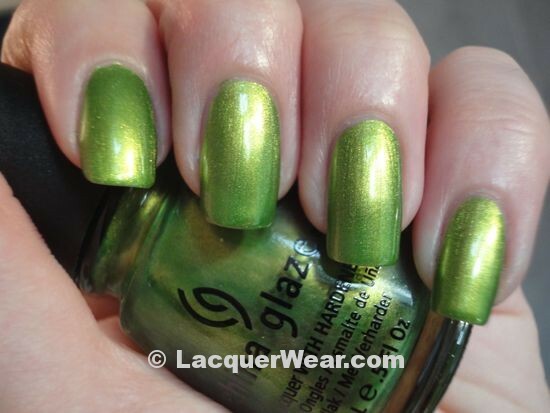 China Glaze polishes have a bendy, skinny brush that I find easy to work with. This polish is a bit sheer and took three coats to be opaque, but I’m thinking it’s intentional, to allow the shimmer to show through. And the shimmer is really great-it’s a heavy, yellow shimmer that sets this polish apart. The base is vibrant enough to show leafy, light green shadows and delicate tints in different light; it’ s a great summertime polish, that loves bright light. I really like this polish in the shade-you can see the vibrant green base and the thick, golden-yellow flash at the same time. I liked OPI’s Red Shatter over Rally Pretty Pink much better than I thought I would, because of the heavy golden sparkle of Rally Pretty Pink. So I started thinking that Red Shatter might have the same surprisingly nice effect over Cha Cha Cha, since it also has a pronounced yellow shimmer. I liked this combination, but it still turned out a little more Christmas-y than I was hoping. The Red Shatter turns darker with a brown tone over Cha Cha Cha, but the green is so assertive that the main color combination still seems to be red and green. This looks complex and baroque to me, and I’m thinking it would be a fun, slightly unexpected Christmas season manicure. But I’m not going to try this again until December. This picture shows the funny brown tone that Red Shatter can take on. 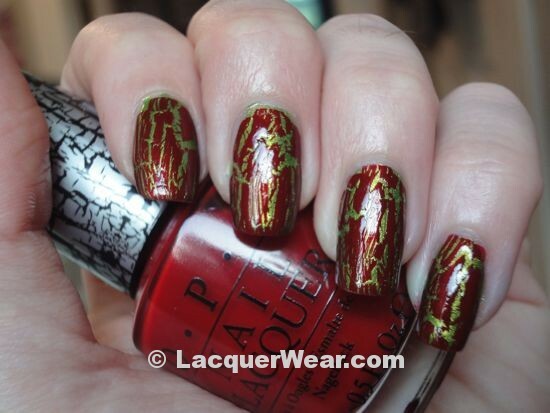 The Red Shatter is so great but seems a bit unpredictable, I think I just need to keep trying it over various colors.